1) Environmental protection, polyester screen line of non-corrosive care, non-polluting, protect the environment. 2) Technical parameters: black, white, transparent color oval diameter of 1.5-3.5mm, Tensile strength (N) ≥ 2200, 17.5% elongation at break. 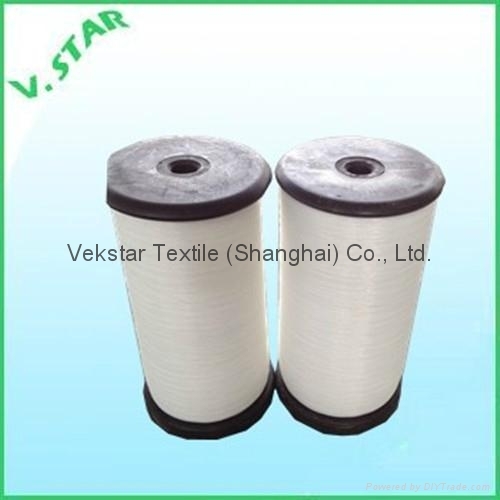 3) Tensile properties: tensile polyester cord care lower screen can easily be tensioned quickly and once tension, supporting screen status line will not rebound to maintain this tension. 4) High strength: polyester screen line care strong black nodules screen care is over 950N; transparent color screen care line more than 710N, thus better withstand the weather outside (such as strong winds 8 to 10) brings The devastating impact. 5) Thermal stability: polyester screen line care ambient temperature -40 °C ~ 70 °C of the cases, the mechanical properties and geometry remain unchanged. 6) UV stability: in more than 30 months of outdoor tests showed that the transparent color screen care line tensile strength decreased less than 3%, the black line of lower intensity care less screen, which means With care in a variety of greenhouse curtain line (glass, plastic film, etc.) and outdoor conditions, life is very long. 7) Anti-acid: As the raw material itself, with this feature, so polyester curtain line capability weathering care, but also extend its service life. 8) Permanent smoothness: polyester screen line is not moisture care, for many years after use, the surface is still smooth as ever, there is no glitch appears. Care screen line by supporting the smooth surface of the sun to its positive role in thermal screen, avoiding the heat of the sun screen wear. End use: the polyester plasteel wire/laminated line are widely used in modern agriculture, greenhouses, gardening and other projects. For example, transparent color screen care line pull-screen system for greenhouse and indoor awning to replace the metal structure products, film lines made with care.The black color support line is mainly used to the greenhouse and outdoor awning pull screen system, also used to support Vineyard. Room 602, Building 25, No 300 West Chuangxin Road Shanghai 201210, China.